All content is derived from book Old Chrudim written by Judr. Jiri CHARVAT with kindly permission of The County museum Chrudim. Translated from Czech by Miroslav George Lukes. Traces of the first Slav settlements were found on the grounds of the present Transporta and the City Park. Archeological evidence points to habitation in the area of the current inner city in the 9th to the 10th century. Chrudim is first mentioned in a document dated 993 wherein the Czech ruler Boleslav II awarded the newly founded Benedictine monastery in Brevnov the right to exact one-tenth of court and market fines from Chrudim. However, it has been shown this document was forged in the 13th century. Eastern Bohemia had been ruled by the Slavnikov clan from their seat in Libice n. Cidlinou until the end of the 10th century. The Slavnikovs were murdered in 995 and their land became part of the principality of Prague. It is therefore probable that the original castle or fortification, which had stood within the site of the present town, had been built only after that year. But it is certain that it stood in 1055 when the Czech ruler Bretislav I died there. The original castle became the seat of territorial administration in 1130 and, approximately by the end of the century, developed into an independent entity governing the district. At that time the Depoltic clan, an offshoot of the ruling Premyslids, controlled the district; accused of threatening the unity of the Czech state, they were forced to depart Bohemia for Poland. 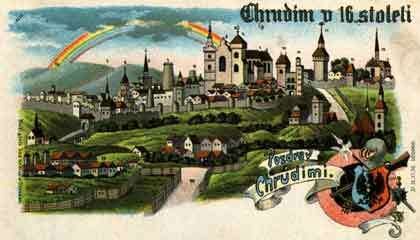 The most important change in Chrudim's evolving history occurred in the second half of the 13th century, when the Premyslid king Otakar II elevated Chrudim to the status of a royal city. A measure of self-government, free markets, commerce and crafts were some of the benefits of the king's act, all protected by fortifications from which the city grew into a fortress in the service of its founder and liege. The exact date of Chrudim's founding is unfortunately not known because the specific document has not been preserved in the original. But it is certain that the town was founded before 1276. To celebrate its anniversary, the city decided on 1263 as the year of founding. Not long after its founding, Chrudim became a 'dowry' town of Bohemian Queens. Substantial social and nationality changes in the composition of the town's population began as early as the onset of the Hussite wars. Jan Hromadka of Jistebnice, a leader in the Taborite Brotherhood, seized the town of Chotebor but was forced to surrender to King Sigismund's adherents led by Jan Mestecky of Opocno. Hromadka was taken to Chrudim and there, on the square, was immolated together with other Taborites. 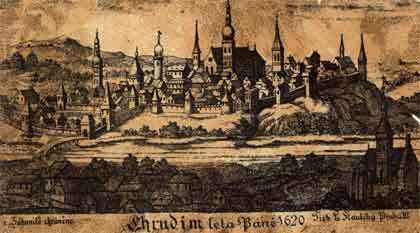 The army from Prague then arrived at Chrudim where it met with Zizka's troops on 26.4.1421. Together the armies decided on a joint attack to conquer the town whose defender and commander, Mestecky, the main culprit involved in the Chotebor bloodbath, quickly accepted an offer to surrender two days later. The royal garrison was allowed to leave Chrudim and its gates were thrown open to the Hussites. Citizens opposed to the new faith were deprived of the right to live in town and to own property there. Some Germans consequently departed and the town became Czech throughout. The Dominican monastery was razed and its monks were probably immolated. When Sigismund ascended the Czech throne at the conclusion of the Hussite wars, Chrudim's ambassador joined in the pledge of fealty to the new ruler in Jihlava. Chrudim also joined other cities in support of Jiri Podebradsky who was elected "Administrator of the mighty and true Kingdom of Bohemia." The generally tranquil evolution, which Chrudim enjoyed in the Jagellon period, came to an end with the reign of Ferdinand I. Chrudim had participated with most Czech towns in a failed revolt against this monarch, and suffered harsh punishment as a result; this included forfeiture of estates and formerly won privileges, and a substantial fine. The community, its economy and financial situation had hardly begun to recover when it was beset by a new, more severe disaster stemming from war. Chrudim again participated in a rebellion against the Habsburgs, but the elected "winter king" (Friedrich von der Pfalz), had no taste for battle and retreated to Germany in face of the forces marshaled by the Habsburgs. 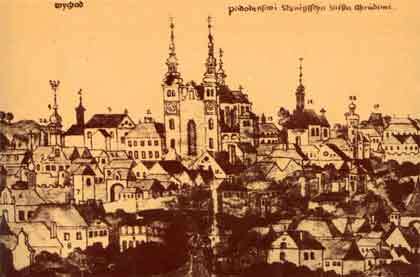 Czech resistance was defeated in the battle of Bila Hora and in 1622 the town was again subjected to confiscation of property and reprisals. Moreover, royal and foreign armies transiting the town were given to plunder and extortion. The now customary quartering of troops in barracks had not been then established, thus the population was saddled with the additional burden of having to billet troops, and meeting their food requirements. Later wars, namely those of the Austrian succession (1742-1744), brought Prussian armies into Chrudim. Their commander, Friedrich II the Great, established his headquarters here. Gradually the town began to recover. Marie Tereza established a post office in Chrudim in 1750, and in 1751 the town again became the seat of a reorganized, permanent regional office. A measure of economic revival resulted, but the influx of German officialdom proved a drawback as it resulted in the gradual linguistic elimination of Czech, which then persisted into the 1860s. The first half of the 19th century again finds Chrudim a quiet country town, as yet unconnected by rail. Its main occupations were in textiles, tanning and agriculture. Revolutionary events of 1848 resulted in a new administrative reorganization, loss of the regional office and criminal court, but both were restored in 1855. Continued growth occurred with the establishment of a railroad link, new town financial institutions, and numerous industrial enterprises.